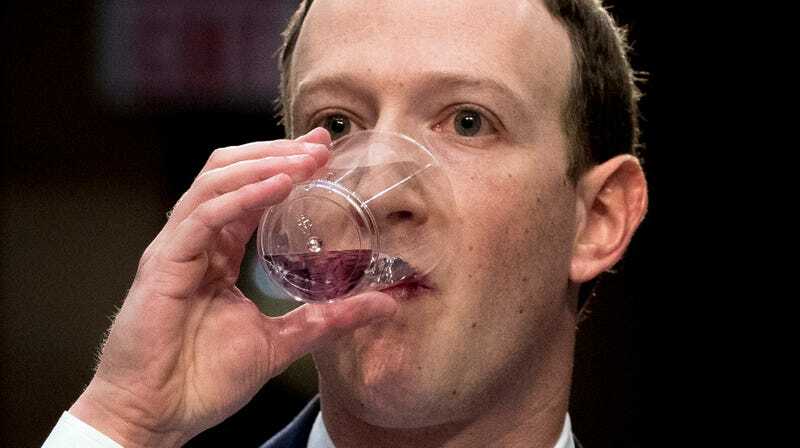 Is Mark Zuckerberg Wet or Dry? As the sun passed over Gizmodo’s New York office on Monday and staffers shook off the muggy torpor of the mid-afternoon, they found themselves drawn into a (seemingly simple, yet surprisingly contentious) debate: Is Mark Zuckerberg, the co-founder and CEO of Facebook, a dry man? Or is he a wet one? The question first arose this weekend, when my girlfriend and I began categorizing public figures as either wet men or dry guys. Tonight Show host Jimmy Fallon, for instance, is a prototypical wet man. The Late Show’s Stephen Colbert a distinctly dry one. Former president Bill Clinton? Wet. Fellow Democrat Barack Obama? Dry. Two-time Oscar winner George Clooney? Also dry. Three-time Academy Award nominee Tom Cruise? Positively soaking. Literal, physical wetness, we decided, is the surest sign of one’s figurative wetness, but one need not be visibly wet—or even a man—to be a wet man. It’s the stain of spiritual flop sweat, an eagerness that verges on desperation, that makes someone wet. Dry, female, wet man Kathy Griffin demonstrates this apparent contradiction well. But what about the tech titans whose whims increasingly shape our world? While their limited public appearances make them harder to classify than movie stars or elected officials, it is just as important to properly determine whether they are wet or dry. The status of some—like soggy and disgraced Theranos founder Elizabeth Holmes—are obvious, but after minutes of discussion, my girlfriend and I were no closer to deciding if Mark Zuckerberg was a wet man. To me, he seemed dry, but slightly oily. Asking my coworkers for input yesterday only further confused the matter. “i think what you’re perceiving as melting is actually his sand-like atoms separating from themselves,” offered a colleague. Another drew a Dungeons & Dragons-inspired alignment chart that suggested powdery/greasy represented a separate axis from wet/dry. It’s easy to see the source of the ambiguity. While Zuckerberg’s curious affect isn’t the kind of aloof cool we traditionally associate with dry men, he rarely gets really sodden either. One could argue that wet and dry are best understood as a spectrum, not a binary, with the Facebook founder falling somewhere near the middle. Neither truly wet nor truly dry, Zuckerberg might belong with the rest of Schrödinger’s damp, keeping company with mossy rocks, old bathmats, and, yes, muggy afternoons. None of this philosophical meandering, of course, brings me any closer to the important answer I seek. So, I ask you, dear reader, what do you think? Is Mark Zuckerberg wet or dry? Did Congress Give Big Boy Mark Zuckerberg a Booster Seat for His Special Day?